I am not one to tell long winded stories in everyday life. In fact my conversations are notoriously short in comparison to what I write on here. There is nothing more annoying than having someone tell a story to end up it being a major disappointment to have listened to especially if it is one they built up a lot. It is not that I am being a b!tch (o.k maybe a little bit) but I am not keen on hearing ever single little detail if they do not contribute to the meaning at the end. Over sharing is one of the main things that lands people in trouble (even easier these days with social media). So I have no intension of getting in the black because I could not keep a filter on my mouth. Also I am sure there are people like me who dislike long winded conversations. If you want a real life example; think about the radio DJs who tell people to hurry up with their story. That is EXACTLY what I want to say to some people. For instance, with a number of couples having Valentine’s day plans there has been a large amount of intentional boasting and over sharing going on. Let me explain. It comes under the umbrella of conversation pitfalls such as name dropping and using unnecessary large words in general conversation. I could be just really unfamiliar with normal talk, but I am sure I do not need to know that you cannot come to Friday’s night’s dinner because you are your “baby” are going on a Moonlight cruise across the harbour with music and candle light. Oh did I fail to mention he is going to get me a *insert jewelled items* on that day too. However this want for the general situation often has lead me to failures in the kitchen. While I do like to read recipes (techniques and stuff) like a small child I am distracted by the pretty pictures and my keenness to get baking the kitchen. I am sure we have been told over and over again to never skim over recipes but reality it is harder to put into practice. This is why learning the basics is so important. At least if you know the basic you can fudge the rest (even though this is very, very bad). Eh.. What wrong with taking a short cut once in while? 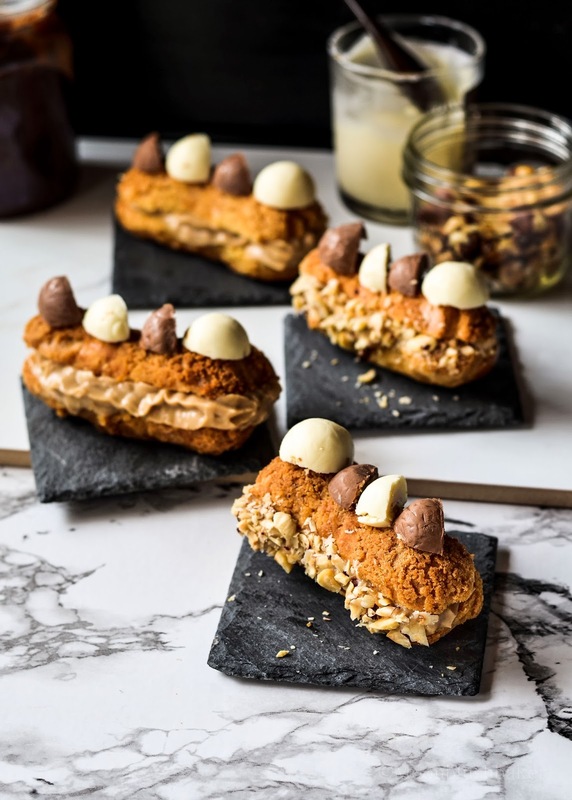 Another short cut in the kitchen, I think we can all try once in a while is Choux pastry. Unlike most other French pastries; a light hand is not needed and most of it can be done in a stand mixer. Simply if you can mix, you can get these little puffs of buttery crispness in your kitchen. 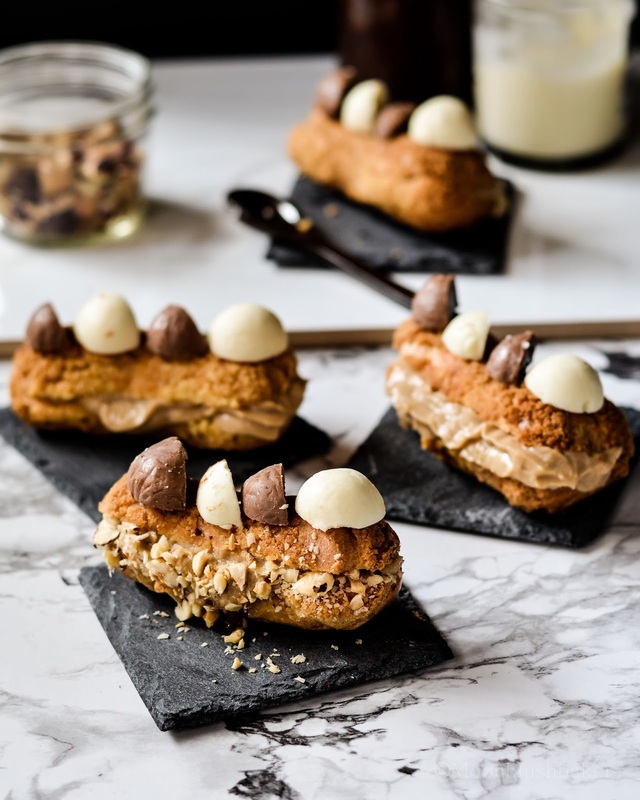 Today the base recipe is an up scaled version of your traditional chocolate éclair. They are in the 2014 food trends, so I feel that I need to say how easy it is to get at home (hey, I am saving you a few *insert currency*). However you do need to be actuate with this recipe, so I recommend a scale or at least have very good measuring technique. 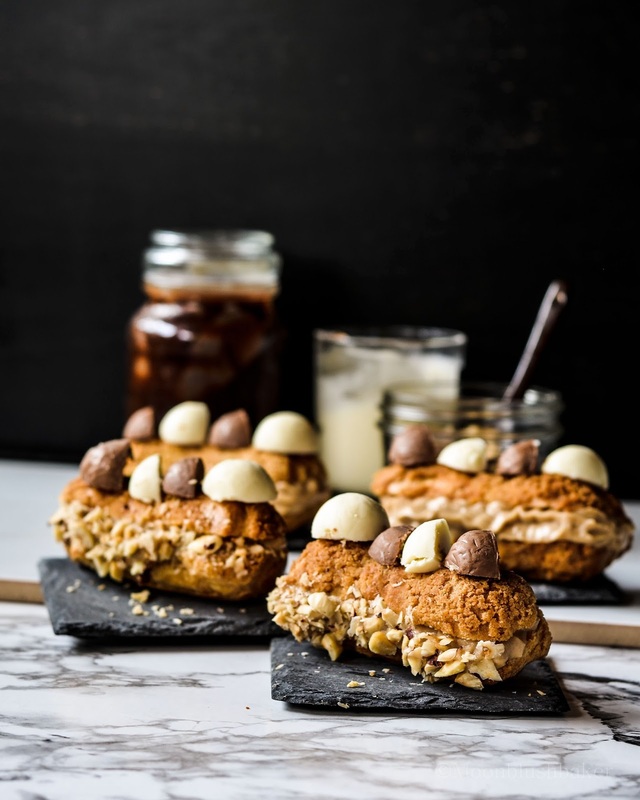 This recipe comes from the Gourmet traveler for a Carmaelia éclair with crunchy almond crust. If you are unfamiliar with Carmaelia, it behaves chocolate but has the rich smokiness of deep caramel. These éclairs are highlighted by notes of basil and orange zest in the cream infusion. I was too lazy to make the salad to go along with it, so I added it to the crème and crusty outside. 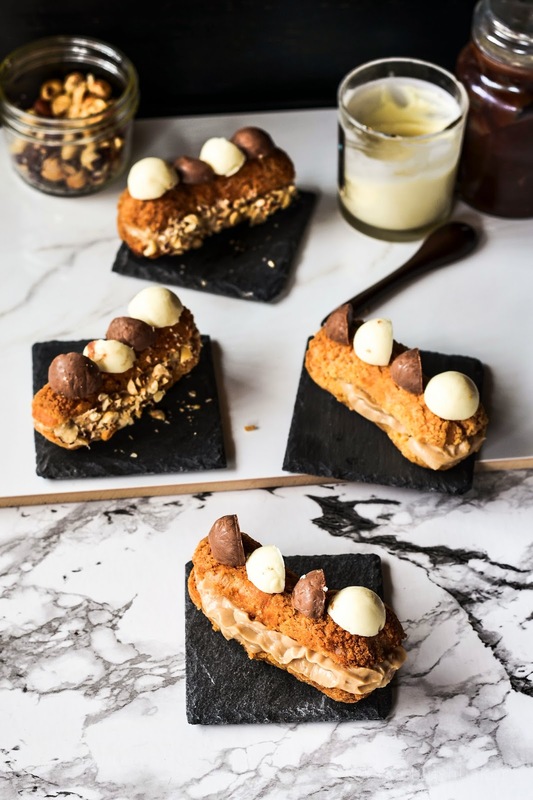 While the crust may look difficult, it is simply cookie dough which is laid on the choux just before baking. Sweet sugary crust is not only for ascetics but I have added a dash of orange blossom water. If you have never tried it before; this is your chance! While others may be tempted to pair it with other sweeter flavours, using fruits and herbs are an easy way to make your cooking look really impressive (short cuts!) Topped with two types of Lindt Chocolate truffles and you have an easy dessert of dreams. Anyway who is going to argue with creamy custard, sugary crust and crispy pastry? In a large pot bring milk, butter, sugar, water and salt to the boil in a saucepan over medium-high heat. Remove from heat. Transfer to a piping bag fitted with a 1.5cm plain nozzle, pipe tw10cm long lines on an oven tray lined with baking paper and freeze until firm (1 hour). In a large bowl, beat sugar, butter, flour, orange blossom water and almond meal in an electric mixer until well combined (1-2 minutes). Roll out between two pieces of baking paper to a rough 14cm x 22cm rectangle and refrigerate for 1 hour. Trim edges to 12cm x 20cm, cut into six 4cm x 10cm rectangles and refrigerate until required. Preheat oven to 190C. Remove choux pastry from freezer. Top each with an almond paste rectangle and bake until starting to turn golden (12-15 minutes). Reduce oven to 160C and bake until golden, risen and crisp (35-40 minutes). Cool on a wire rack. Bring glucose, sugar zest, basil and 60ml cream to the boil in a small saucepan over medium-high heat. Allow to cool then strain. Add chocolate, stir until smooth, then refrigerate until cool and nearly set (1-1½ hours). Whisk remaining cream in a separate bowl until soft peaks form, fold into chocolate mixture in three batches, transfer to a piping bag fitted with a 1cm-diameter nozzle and refrigerate until firm (30 minutes). Slice the éclairs length ways. 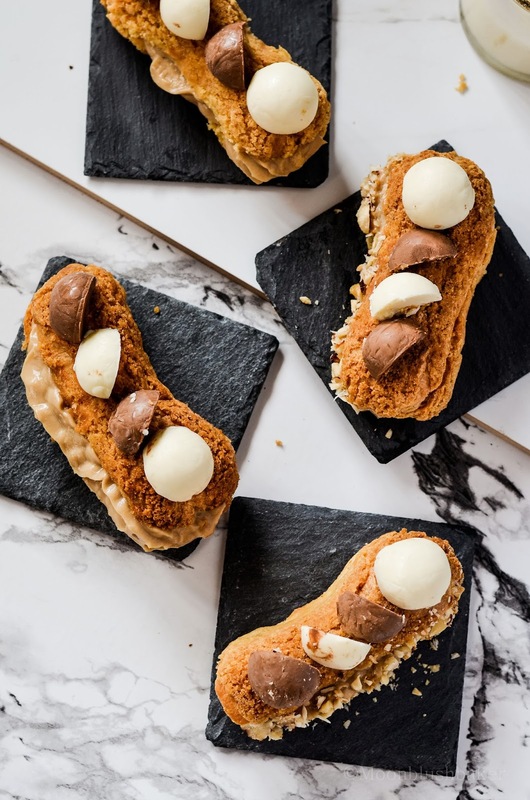 If there is uncooked choux, scoop it out. Pipe crème into tube. 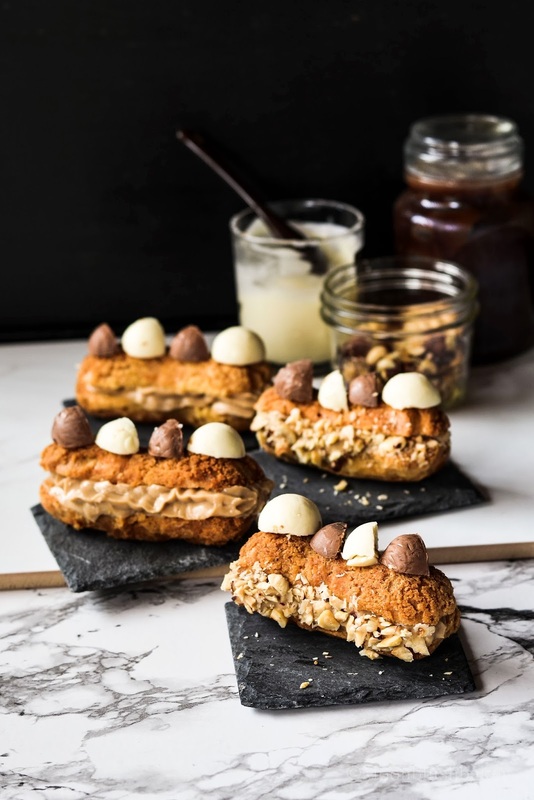 Press in chopped almonds to the creme filling Repeat with remaining éclairs. 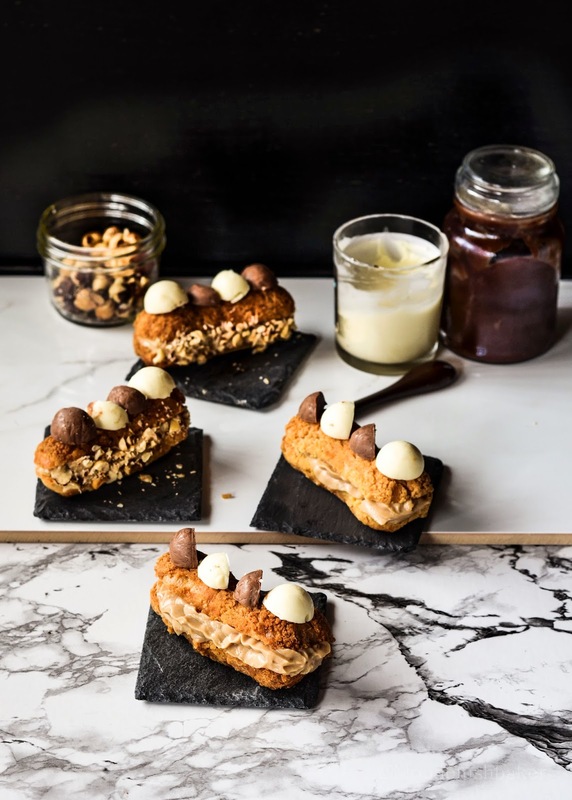 Glue the lindt quarters to the top of the éclair with melted chocolate. Fridge for 1 hour before serving. I haven’t made choux pastry in forever! We’d do it for gougeres at the restaurant I worked at. 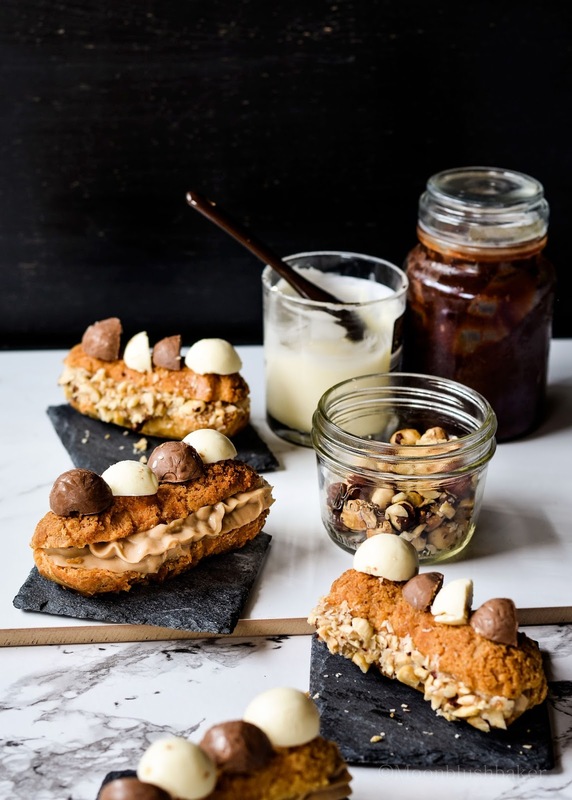 Love the idea of freezing the eclairs til ready to use! Beautiful! Social media definatly encourages people to over share! Agreed! The only thing that should be over shared is desserts!